The following video tutorial will show you how to patch external synths (other iOS synthes and apps) through the Model 15 synthesizer by Moog using Audiobus. In this case you see the output source as Audiobus input and the Model 15 input as Audiobus output. You might want to for example run an app through the Model 15 filter. This is how you can route the signal into Model 15 using Audiobus. App Attack Ep 003 “FL Studio Mobile IAA Animoog Midi Sequence” – Lots of viewers are asking if I would use an iPad when composing for TV shows. I have songs in several TV shows and I do use the iPad from time to time to get ideas started. 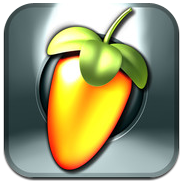 My favorite app for sequencing midi sequences is FL Studio Mobile. I just really like the piano roll and editing features. They just make sense to me. I also like using IAA (Inter App Audio) when using FL Studio Mobile. IAA is Apple’s proprietary method of routing apps internally. I slammed this little jam down in about 20 minutes. I was inspired by a preset in Animoog. It was used subtly. Other sounds were from the FL Studio Mobile synth. Thanks for watching and please subscribe so I can continue to create more videos and free loops. • Compatible with: CoreMIDI (MIDI in and out), Virtual MIDI, Line 6 MIDI Mobilizer I & II, iRig, iRig Mic, iRig MIDI, Yamaha i-MX1, Apogee Jam, Blue Mikey, Alesis IO Dock, iConnectMIDI, Line 6 Mobile Keys, Line 6 Mobile In, Tascam iU2 and many more. Adding new presets or importing presets into Animoog is quite simple. 1) Connect your iOS device to your computer. 4) Click on your device on the left panel. 5) Select the “Apps” tab from the top middle section of iTunes. 5) Scroll down to the “File Sharing” section. 6) Select and click on Animoog from the list of apps. 7) From iTunes, drag the Presets folder to your desktop. Then drag your custom presets into that folder, and drag it back to iTunes file sharing (overwriting the old Presets folder). You can even create a sub folder within that folder to keep things organized. **Create a folder on your desktop. Locate your .preset file on your hard drive. You can create your own patches and presets and export them as a .preset file for back up OR you can purchase .preset files from third party sound designers. Download these free Techno presets to start http://www.moogmusic.com/presets/Movement.zip Place them in the folder on your desktop and call the folder “Presets”. You can even create sub folders within this folder. Moog is proud to announce that Animoog is the official synth app of this weekend’s world famous Movement Electronic Music Festival in Detroit. The Motor City is cited as the birthplace of techno and to celebrate its contribution to electronic music, Moog asked Juan Atkins, Kyle Hall, Mike Huckaby and Carl Craig- 4 of Detroit’s top techno producers – to create a unique preset pack for Animoog. If you can’t be in Detroit this weekend with Moog and the 100,000 other revelers watching the Godfathers of techno play at Movement 2012 then download this FREE Preset pack today and be with us in creative spirit. 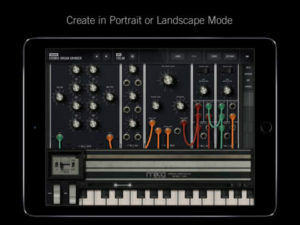 As part of Moog Music’s birthday celebration honoring founder Bob Moog, Animoog for iPad is available for $9.99 through 5/29/2012. Animoog, powered by the new Anisotropic Synth Engine (ASE), is Moog Music’s first professional polyphonic synthesizer designed exclusively for the iPad. ASE allows you to move dynamically through an X/Y space of unique timbres to create a constantly evolving and expressive soundscape. • Anisotropic Synth Engine (ASE) – An exciting new Moog technology that allows the user to move dynamically through an X/Y space of unique timbres to create an expressive and constantly evolving soundscape. • Polyphonic Modulation – Simply slide your fingers to control multiple modulation parameters in Animoog right from the keys. • Polyphonic Pitch Shifting – Easily manipulate the exact pitch of each note in a chord by rotating or sliding your fingers. • Delay Module – A classic analog style ping pong delay. • Thick Module – From bit crushing to unison voice detuning and drive, this module adds depth, edge and character to Animoog’s already massive sound palette. 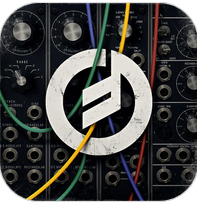 • Moog Filter – The classic four-pole Moog ladder filter with High Pass, Low Pass and Band Pass modes. • Record Module – Record your performance and overdub new layers, or play along live. Transfer recordings between Animoog and any other apps which support the general pasteboard. • Path Module – Direct ASE through Animoog’s X/Y space to create new expressive and shifting sounds that will blow your mind! • Orbit Module – Control the rate of orbit in the X/Y space around the path you created for subtle to insane voice manipulation. • Flexible Modulation Matrix – Amp, Filter and Mod Envelopes, LFO with infinitely variable wave shapes and sync, and four super flexible and assignable modulation slots. • MIDI in – Use your Little Phatty or any other MIDI controller to control Animoog. 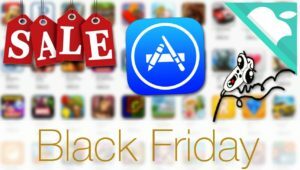 Animoog is available for the iPhone for only $0.99 for a limited time! 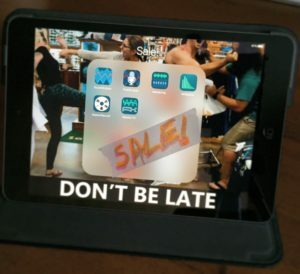 Animoog is available for the iPad for only $9.99 for a limited time!